Dark chocolate is slightly bitter in taste and has a dark brown color without added milk. It contains cocoa solids, cocoa butter, and sugar without milk, unlike milk chocolates. 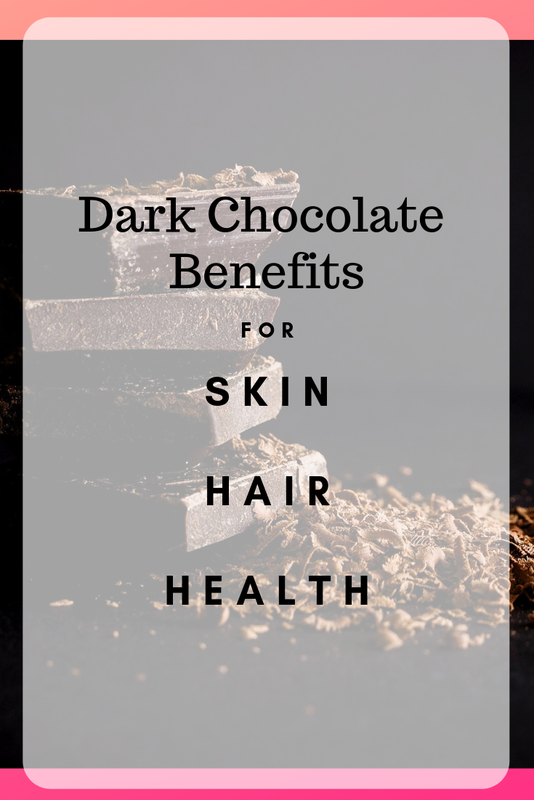 Dark chocolate is not only good for skin and hair but also good for overall health. Dark chocolate is a powerful source of antioxidants that help in reviving skin cells. It lowers the early signs of aging and gives skin a youthful look. Antioxidants in the dark chocolate cure skin alignments fastly. Dark chocolate, if consumed in the right amount, gives a glowy skin. It protects skin from UV damage like sunburn and skin cancer. It's actually a skin detoxifier that slough off dead skin cells that could cause skin blemishes if not removed properly, giving a new fresh skin. 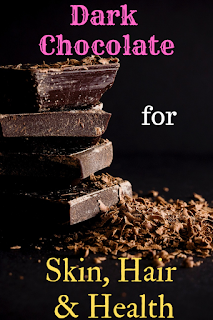 For acne prone skin, it's better to eat dark chocolate than milk chocolate because in dark chocolate there is a high number of antioxidants that reduce inflamed acne. There are also useful tips for treating pimples in the post 'How to Treat Pimples'. Dark chocolate helps in scalp's blood circulation. This increased blood circulation helps in promoting healthy hair and reduces hair loss, making hair stronger and grow faster. It also increases hair volume, making hair look shiny and thicker. It has anti-inflammatory properties that lower the risk of scalp infection. Scalp infections can severely affect hair and could cause baldness. 1- It lowers the possibility of heart disease and bad cholesterol level in the body. Bad Cholesterol clogs veins and arteries that is the main reason for heart disease. Dark chocolate reduces bad cholesterol level thus lowers the chances of clogging and heart disease. 2- It might be astonishing that dark chocolate helps in balancing the blood sugar level rather shooting it up. It's a sugar enriched substance but its glycemic index is low thus doesn't affect the body badly. 3- Dark chocolate can be good for eyesight. Flavonoids in dark chocolate encourage blood flow to the brain that in result can improve eyesight. 4- It improves mood and can be eaten for feeling better. Those who are feeling low and have mundane days can add dark chocolate in their diet. 5- If a body has a lack of iron then it makes it tired. For people, suffering from anemia can eat dark chocolate; make it apart of their diet for increasing blood level in the body. 6- High blood pressure is a cause of many maladies. Dark chocolate contains magnesium and copper that control blood pressure, especially fluctuating blood pressure. 7- It increases body endurance. Dark chocolate works wonders when in practice, hard work required for a long time. It can make the body stronger and healthier for the long run. How Much Dark Chocolate Per Day is Good for Health? 1-2 ounces or 30-60g is the right amount of dark chocolate per day. Consuming more than that could result in taking extra calories and not good for you. Eating too much dark chocolate could give immediate heartburn, indigestion, and headache. You can also check, Dark Chocolate Best and Worst Brand. This is amazing! I love dark Chocolate and heard it is very healthy. I should eat it more though. Good to know! I do enjoy my dark chocolate and have it often. I'm glad there are so many benefits. Yep. That is why my parents now just eat the dark ones. Really helpful! but sometimes I still prefer the regular one ohhh craving! 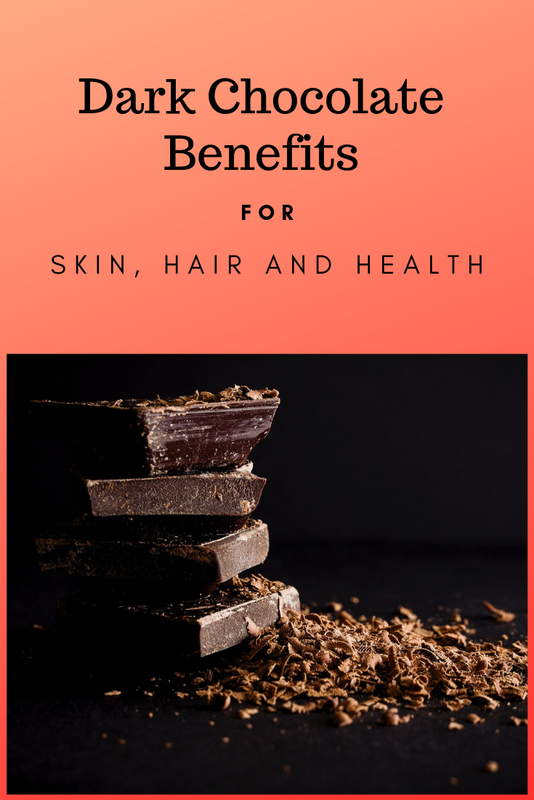 I have to admit I didn't know these benefits of dark chocolate, perhaps I need to try a little nibble every now and again, I used to find it too strong. 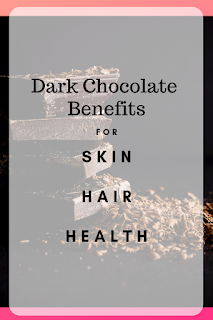 I had no idea eating dark chocolate was good for my hair and skin, but it totally makes sense, especially considering the antioxidant and anti-inflammatory properties. I actually love dark chocolate. But I did not know that it is good for skin too. it's so great that chocolate has so many health benefits. I take this to mean i can eat all i want LOL! I do love chocolate and can et so much if it! even more so now that i know of all its benefits! This is good to know as I do like chocolate. I like dark chocolate with peanut butter the best. Well I had no idea dark chocolate had so many benefit. All I know is I love eating it! Thanks for all the information. I love that there's so many health benefits of dark chocolate! It's so cool to know that it helps with blood circulation, blood pressure, has antioxidants, etc! You can't argue with that. That's a whole lot of good reasons and I'm all for an excuse to eat chocolate. I've noticed that as I'm getting older the less I really like the sugary chocolates and actually prefer darker chocolate. I have always loved hot chocolate. I knew about some of the health benefits but benefits to skin and hair is new to me. Thanks for the info!! I never thought dark chocolate has been this good. I knew the taste was great but the benefits are even better. Can't wait to try one right now. I love dark chocolate , I know it is good, but not new this much health benefits it have. I am going to eat dark chocolate every day from now. I love dark chocolate I knew it helps with moods and all but never knew the other benefits so it's great to know. 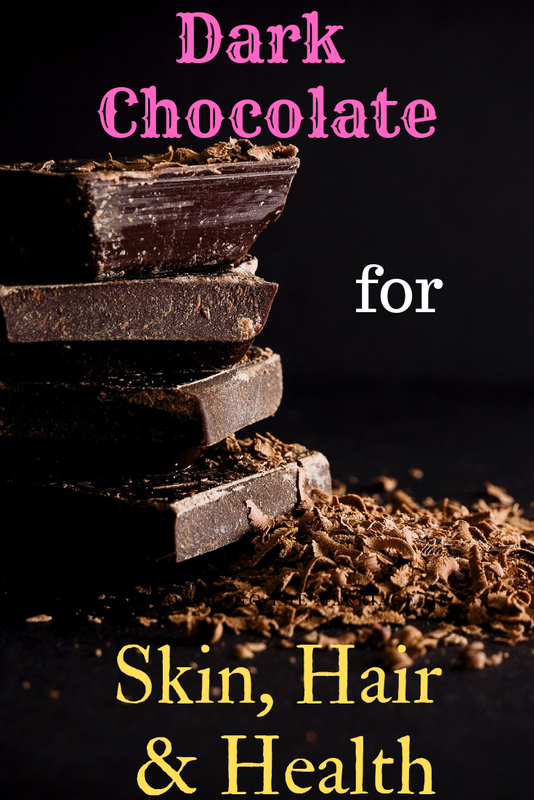 Dark chocolate is seriously a super food, however people need to make sure to find SUGAR FREE dark chocolate in order to truly obtain the benefits! Good to know! I eat a lot of dark chocolate. It's so dang good. My husband LOVES dark chocolate, but I'm more of a white chocolate girl. May need to switch things up! I am not i to dark chocolate but my partner likes it. I prefer the dark sweet ones. I didn’t know there are lots of benefits in our body. I actually don't mind dark chocolate, it's pretty good. I'm glad to now know it has so many health benefits as well, especially for my hair! I love dark chocolate. your post gives me even more reason to eat dark chocolate. I used to not be a fan of dark chocolate, but since going vegan, I can't get enough. Added benefit that it is good for you too. Dark chocolate is so good. Thank you for reminding me that it has definite health benefits! I won't feel as bad next time I eat some! I usually keep a bar handy. Dark chocolate has a lot of reasons to eat it! There so many health benefits you can get from eating dark chocolate! It's so great to know. Weight Loss Tips for Women. Does Weight Loss in Women Different than Men? Obesity is the root cause of many illnesses. Sometimes we gain weight by overeating or sometimes there is an underlying cause of it. Skipping meals isn't a good option to lose weight. Every woman is different. Therefore, first find the reason behind weight gain and then work on losing it. You can check whether you are overweight or underweight by calculating your BMI (Body Mass Index). Following are the tips that may help you losing weight. Generally, a woman needs 2000 calories per day but this could be different to each individual. Some women burn calories quickly than others and some have a quick weight gaining tendency. An important thing is to count on calories. For losing weight, it's recommended to eat 1500 calories per day. It helps you to lose 1 pound weight in a week. Drastic weight loss isn't a good option, It's better to gradually lose weight at a nice pace. Excess Sugar intake isn't good for our body and it can have many side effects. It's better to take only daily recommended sugar and if possible take added sugar as less as possible. Sugar can affect different parts of our body but here, I am writing about 5 main reasons to use less sugar in our daily diet. Taking too much sugar in your diet links to acne. Sugary foods, juices, and drinks may cause breakouts. You can apply sugar scrub on your face and it doesn't cause any breakout, only you need to eat less sugary foods. High sugar diet increases sebum production and inflammation on the skin which results in pore clogging and acne on the face. Sugar also causes early aging. Early signs of aging include light wrinkles around eyes and mouth. According to studies, sugar reacts with the protein in our body and produces advanced glycation end products. These products result in early aging. Vitamin D is a term given to both Vitamin D2 and Vitamin D3. The differences between both are; the first one is obtained from plants and another one is obtained from sunlight and animals. Vitamin D3 absorbs more quickly in the body than vitamin D2. Vitamin D3 is actually not a vitamin, it's a hormone which improves intestinal absorption. It absorbs healthy nutrition mainly calcium. Deficiency in vitamin D3 results in the weaker immune system. According to researchers, vitamin D3 plays a vital role in boosting our immune system. It activates the immune system's T cells that are responsible for immune response. Vitamin D3 helps in fighting with infections so people having low Vitamin D3 level are more prone to infections and illnesses.